The belief of who we are today, comes from a rich history that needs to be preserved and passed down to future generations. Here as media and was born in Topaz, Utah. We came to go to Amache and learn about Japanese American heritage. Jenni, Katie, and Millie King - "Whose America? Who's American?" A great chance to meet old and new friends. Learned so much from the Issei and Nisei participants who shared their stories. JANM did a wonderful job in organizing this conference. Kenny Endo - " Whose America? Who's American?" I brought 2 of my children because they are almost retired. I wanted them to learn about war times & what the families went through. Brings back fond memories of the early days of the Museum. 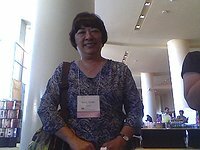 I came to the conference to listen to some of the great speakers and writers. Hope to see the Amache Camp tomorrow. Didn't go to camps so can't tell you about my camp experience. Ruth Hatchimonji - "Whose America? Who's American?" I remember those who didn't make it back - I'm a retired mental health clinician. I have seen those who didn't make it back to 'normal' main stream life. Toru Saito - "Whose America? Who's American?" 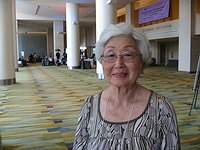 To learn about the Japanese-American experience! Bill and Emi Shishima - "Whose America? Who's American?" We came to help JANM out with the conference and had a great time! 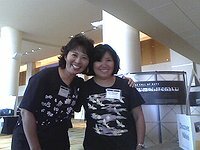 Cindy and Tay Kondo - "Whose America? Who's American?" 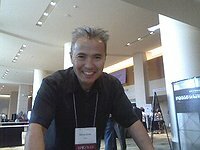 I enjoyed the conference in Arkansas so much. I wanted to have that sort of experience again. Great conf. Had a long wonderful trip to Amache yesterday. Thanks! June Aoki - "Whose American? Who's America?" It's been a great conference. 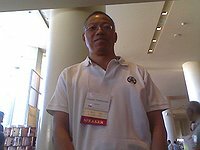 I regret that I could not attend all of the sessions. Minoru Tonai - "Whose American? Who's American?" 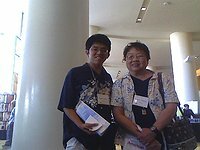 Brought my son and his family to the conference in order to experience some Japanese heritage of the past and present. 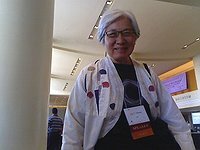 Shirley Tsuchimoto - "Whose America? Who's American?" Great conference. 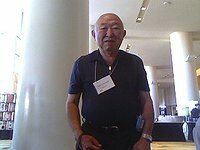 Learned all about the Denver Japanese American community--Ralph Carr and the Shitara sisters. All things were new to me. Thank you. I came to discuss the German American and German Latin Experience during WWII. 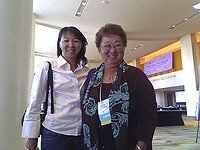 Renie Yoshida Grohl and Joyce Mizunaga - "Whose America? Who's American?" 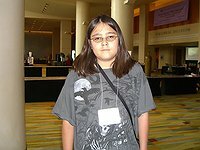 I came to this conference because along with my parents, I was interned at Amache, and have wanted to learn more about this experience. Miki Stebbing - " Whose America? Who's American?" 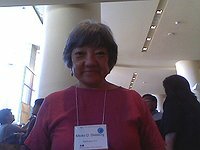 Aileen Okimoto and Joyce Mizunaga - "Whose America? Who's American?" I came mainly to visit the Amache site where my family was interned. It was a very fulfilling experience. Katherine Domoto - " Whose America? Who's American?" 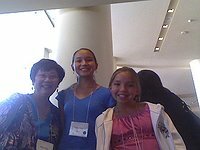 The conference was terrific - only wish my parents were alive to see that their experience in Amache will not be forgotten. Thanks to the museum and sponsoring organizations for a job well done and for all the HARD work! 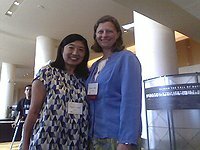 Erin Valenciano and Jan Ogawa - "Whose America? Who's American?" I am a sansei. My parents were interned at Poston. I am excited to be able to attend this conference! Thank you! Teri Ozaki - "Whose America? Who's American? " Kids - "Whose America? Who's American?" Here with the National Park Service. Had a great experience on the bus trip discovering the Wada and Homma family histories. Richard Potashin - "Whose America? Who's American?" Came to learn + meet friends. 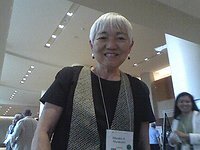 Lillian C. Kimura - "Whose America? Who's American?" Great conference and renewed old friendship. 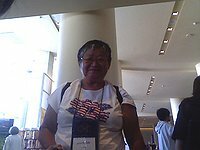 Former Jerome and GIla camp attendee--from Hawaii. 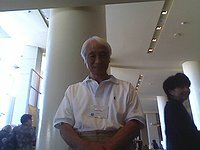 Father Kinzaemon Odachi, Tenrikyo Shinto minister. Died in Santa Fe, New Mexico. Never got to return to Hilo, Hawaii. Ashes were returned to Hilo and buried in Hilo, Hawaii. 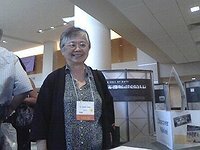 Masako Ebisuzaki - "Whose America? Who's American?" 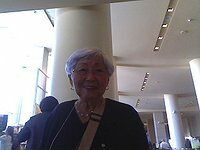 To support the Japanese American National Museum. 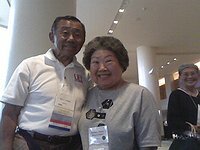 Takeshi and Yoshie Wajima - "Whose America? Who's American?" This conference is important because it teaches people about Japanese culture. Jennifer Chikuma and Scott Chikuma - "Whose America? Who's American?" Came to Amache, first for history and closure. It's been 63 years since I've been back. When my sister, brother, and I saw the foundation, it brought back a flood of memories. Homma siblings - "Whose America? Who's American?" Each JANM conference fosters scholarship and introduces us to each other through a common thread of history. Jane Beckwith - "Whose America? Who's American?" We're here to represent my family who was at Tule Lake. 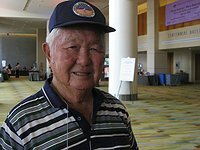 I've always wanted to hear Senator Inouye, too. 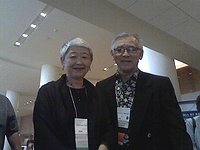 John Okada and Sharon Staples - "Whose America? Who's American?" 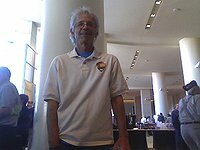 At age 72, I am still finding out what our common experience meant/means. The youngest among us show us the way. 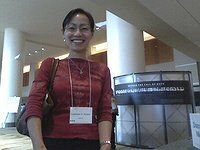 Irene Misako Hadeishi - "Whose America? Who's American?" This conference is so inspiring and enlightening. 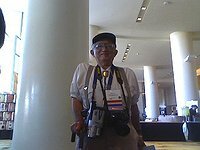 I've learned so much history about the pioneer Issei and Nisei. 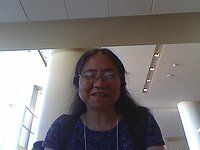 Kristin Okimoto - "Whose America? Who's American?" 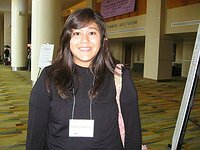 Barbara was interned at Amache, CO, block 8G. We were taken to my barrack by Dr. Bonnie Clark who located the exact spot I lived at age 5. 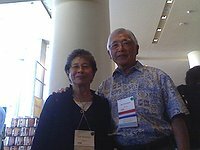 Harold "Hal" Keimi and Barbara Reiko Mikami-Keimi - "Whose America? Who's American?" Came to learn more about the camp experiences and influences on society today. 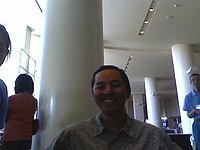 Also how the Japanese American experience influences how other minorities understand and relate to current issues. 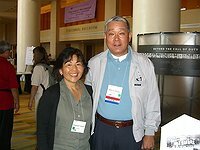 Roger Tanioka and Susan Tanioka - "Whose America? Who's American"
What an overwhelming experience this was! Lily Harvey - "Whose America? Who's American?" We enjoyed the conference immensely. It was very informative, emotional, and uplifting! Was very impressed with Mr. Hopper and his students and what they are doing with the preservation of Amache. They hosted our great visit to the camp. 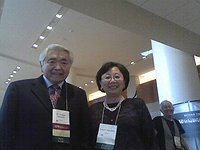 George and Kashiwa Hatamiya - "Whose America? Who's American?" 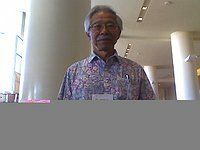 Came to the conference to find out what was going on to preserve the Japanese heritage. 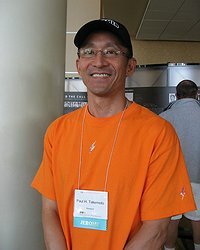 Ted Yonemoto - "Whose America? Who's American?" 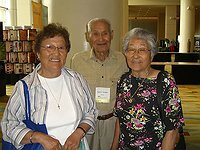 As 4th and 5th generation Coloradoans and Japanese Americans, we came to learn more about our community and history. Kenzo and Mika Kawanabe - "Whose America? Who's American?" 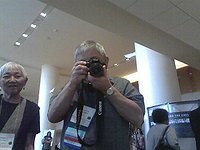 Need more conferences/programs so we can learn more about "our" experience. 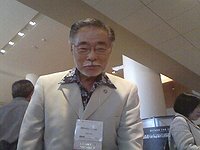 Richard M. Murakami - "Whose America? Who's American?" 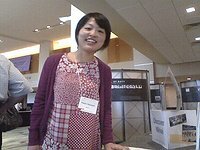 Tsukasa came to the conference as a speaker. I came as a tag-a-long and was thoroughly impressed with the scope and depth of the event. 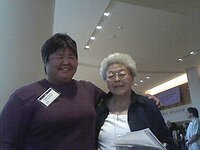 I am impressed with the commitment being made to carry on the work in educating our country about the Japanese American experience. 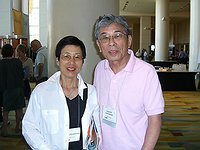 June and Tsukasa Matsueda - "Whose America? Who's American?" Continue to fight for equality and justice. 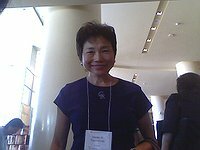 Mitsue Takahashi - "Whose America? Who's American?" Conference was very well organized. I thoroughly enjoyed being here and seeing how hard the leaders are working at pursuing social justice, etc. Good job! 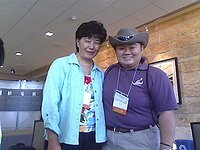 Bertha Shimazu - "Whose America? Who's American?" 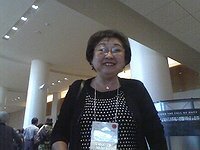 I decided to attend the conference because I would like to get to know more people in the Japanese community. I've celebrated the 4th of July for 31 years, but to be with these humble, heroic veterans is one of the most memorable. Truly service is patriotism. Their story must be told to remind us that patriotism is more than waving a flag; it is sacrifice. 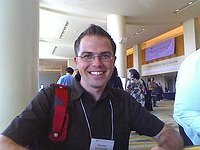 Christian Heimburger - "Whose America? Who's American?" Cathleen Kozen - "Whose America? Who's America?" 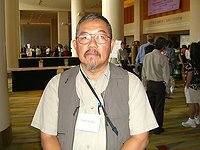 Chester Hashizume - "Whose America? Who's American?" I'm researching about Japanese American religion. 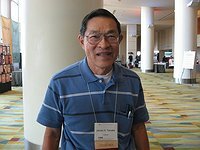 I thought Japanese Americans have very strong community connections. I could get a lot of different view points. However, I think I can fit here, but I can't fit here at the same time as a Japanese. 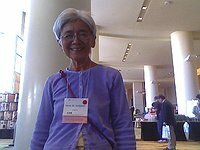 Hisako Narasaki - "Whose America? Who's American?" 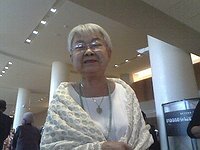 I came to the conference because my grandmother and her sisters were all placed in internment camps when they were young. I saw how much their experiences impacted their lives and I wanted to learn about other people's experiences. Fred was born in Brooklyn. 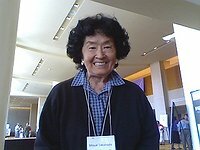 Mitsue was born in Hood River, OR and spent the summer of 1942 in Portland Assembly Center. We met in NYC. We have been interested in telling the story of our WWII era experiences. 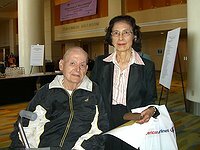 Fred and Mitsue Salador - " Whose America? Who's American?" 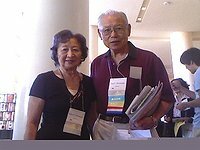 Glenn and Yoshiko Kumekawa - " Whose America? Who's American?" 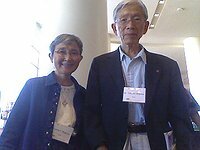 Milton and Christine Omoto - "Whose America? Who's American?" 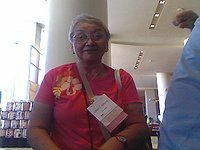 I'm producing a documentary on Gila River, so I'm hoping to meet many former internees and other Japanese Americans who are willing to share their experiences with me. And I want to fish for a kiss from George Takei. Kellye Tamura - " Whose America? Who's American?" As an African-American who participated in the Civil Rights Movement, this conference helps me to understand the broader civil rights struggle in America. I realize that one people's suffering and oppression have to become part of the larger American story. I am my brother and sister's keeper. 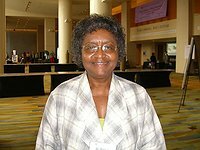 Dr. Sybil Jordan Hampton - " Whose America? Who's American?" Grace and Rose are childhood friends. They were both born and raised in Colorado. 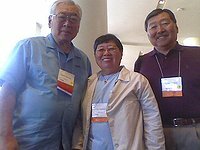 Grace Tochihara, Don and Rose Tanabe - " Whose America? Who's American?" 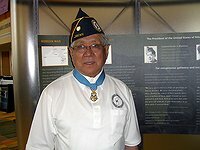 "Hershey" Miyamura is a Medal of Honor recipient awarded for his actions during the Korean War. 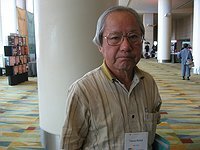 Hiroshi "Hershey" Miyamura - " Whose America? Who's American?" 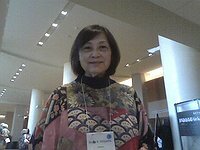 This conference is a way for me to learn more about Asian American history. Most schools don't like to teach extensively about it. So this is big for me. Joey Day - " Whose America? Who's American?" I felt drawn to this event on several levels. 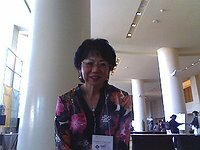 As an educator, I feel a need to become further educated and acquire material to more effectively teach the Japanese American experience. As a Nikkei I wanted to celebrate the 20th anniversary of Redress along with others of our community. 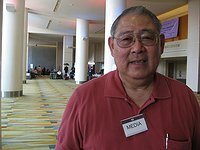 Dan Kubo - " Whose America? Who's American?"